Michael Smith (pink) is available for Posh for the visit of Bradford City. Photo: Joe Dent/theposh.com. Manager Graham Westley will freshen up Peterborough United’s starting line-up for the visit of Bradford City to the ABAX Stadium for a League One fixture tomorrow (February 13, 3pm kick-off). Westley revealed there were plenty of tired bodies - and a couple of sick ones - following the penalty shoot-out defeat in an FA Cup tie against West Brom on Wednesday (February 10). Adil Nabi could play a part for Posh against Bradford City. Photo: Joe Dent/theposh.com. So he’s grateful that he can call on quality players who missed the cup tie for a tricky game against the mid-table Bantams. Defenders Michael Smith and Ricardo Santos are now free of suspension, while striker Tom Nichols and attacking midfielder Adil Nabi are also available again. Westley said: “A lot of players spent a lot of energy against West Brom. Andrew Fox for instance ran over 17k in the game which is an amazing amount and all done at a high pace. “There is inevitably some tiredness and fatigue and one or two were sick after the game because of dehydration. “Energy will be a big deal tomorrow, but there are some easy decisions for me to make because I will have to freshen the team up. I have no other choice. “I am in the fortunate position of having fresh legs available. Everyone is up for selection apart from the long-term injured players, but to what degree they are in my thoughts depends on what I’ve seen in training and in reserve games. Bradford were the opponents in Westley’s first match in charge of Posh at the end of September. 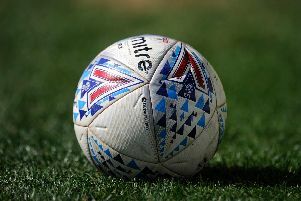 Two goals in two second-half minutes from Lee Angol and Chris Forrester secured a rather comfortable 2-0 win for Posh and they have history on their side tomorrow as Bradford have never won in 14 Football League meetings at London Road. Westley added: “The progress we’ve made since that game is there for everyone to see. We were a bottom end team then and now we are a top end team. “We have become renowned for certain things. The team now stands for something and we showed the level we can reach in the game against West Brom. “We out-passed a Premier League team the other night. We matched them for pace, energy abd for quality. “We wanted to reach the fifth round of the FA Cup, but the fact that we are out should help our league campaign.